Pimp any Facebook profile with Profile Headers and add a striking image or personal message to the photostream banner at the top. Update: With the advent of Timeline, Profile Headers has become obsolete. Sign up for the launch of Facebook Timeline Covers. "It's seriously awesome!" 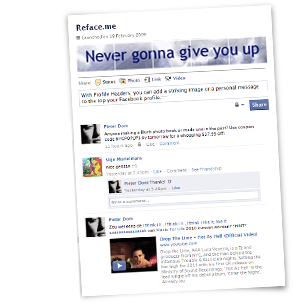 --Reface your Facebook. "We know, and we're still adding features..." --ProfileHeaders.com. "Wait! You did activate the new Profile, right?" --Person o/t Year 2010.